If they start putting up statues for POY and NC, schools could use that as recruiting tools. Become POY and win a NC and we will put up a stature of you. If Uconn did that they could fill a garden with numbers that would soon rival the terracotta warriors in China. Statues are very rare, though, especially for players. There are a few statues of women coaches. Summitt and Conradt, for example. Statues of women athletes are virtually unheard of. In all fairness, all four horses are mares. So Mary Murphy finally made it. And technically, one of those 4 players also ended up being a ND coach. The Four Horsemen are a case of "an exception that proves the rule." 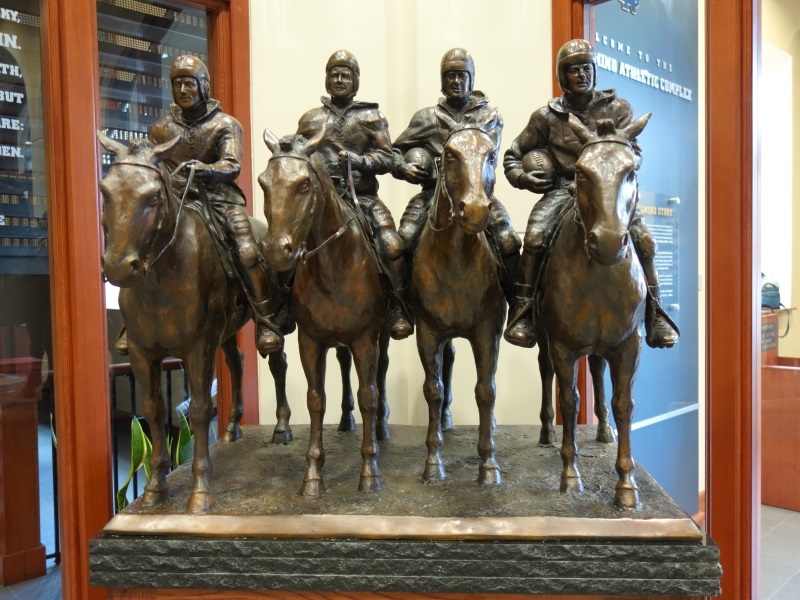 In order for players (even Football players) to get statues, they have to get into "Legendary" status (The Four Horsemen are immortalized in the famous Grantland Rice story that starts with "Outlined against a Blue Grey October sky..."). Also, all the statues mentioned here that are on ND campus are very recent (I'd say the last 10 years or so). I think they started putting them around the stadium after the last expansion. When I was at school the only statues on campus I can remember were Jesus, Mary, Moses, Fr. Sorin (Founder of the school) and Fr. Corby (Former ND president who was a chaplain in the Civil War. The statue is a replica of one on the Gettysburg battlefield), and Dr. Tom Dooley (a ND alumnus who founded a whole bunch of hospitals in southeast Asia back before most Americans had heard of Cambodia or Vietnam). Rockne had a bust in the Rockne Memorial. There's a statue of Sheryl Swoopes in Lubbock and she only won 1 Title , so i dont see whats so weird about Aja Wilson having hers. Was it erected right after she graduated or years later? Part of the puzzlement here I think is because it's so soon. Generally people get statues long after their accomplishments have happened. Would it be this big of a deal if they waited a few years ? If anything the moment would lose its prestige after Wilson has graduated 5 years down the road. I like the idea of doing it the same year she graduates as an appreciation to a player who changed the landscape for that program. Lord knows they most likely will never reach those heights again . Most of the time schools will honor a player by retiring their number or inducting them into a "Ring of Honor" or something like that. I don't think anyone here would bat an eye at one of those things being done. Is a statue being planned right after a player's graduation any different than allowing an injured player to make a basket to set a scoring record? Not trying to be snarky, but just pointing out there are different ways to honor certain players whose accomplishments transcend their respective universities. Only if the school set up a video monitor in the lobby of their arena replaying that shot 24/7/365. BTW, I remember a few years back when NC St was retiring their old arena their last game was against ND, and they had a senior (Krystal Barrett ) who was injured but who was big for their program. ND was up 10 points and with 24 seconds left NC St. subbed in Barrett, and ND left her completely open so that her 3 point shot would be the last shot in that arena. I was talking with a South Carolina booster this weekend. He's very excited at the prospect of a Wilson statue on campus. A recent issue of ESPN magazine has a really nice article on A'ja. I find it funny that all their ears are back...but then it looks like they used the same mold for most of the body parts and just slightly changed up a few. Why would anyone even be surprised about ND being granted immediate eligibility for Shepard. I mean considering the favoritism that was shown towards ND in years past. The advantage granted the "four horseman" was beyond unreasonable. It is no wonder they did so well being allowed to play the game mounted on horses. Wilson is probably top 4-5 all time in SEC women’s basketball, I think she’s deserving of this. 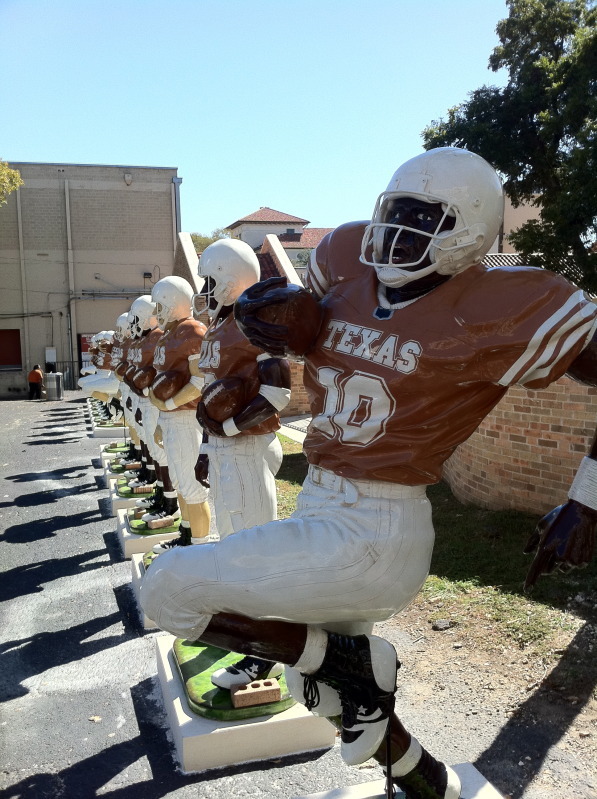 Dang, you couldn't find a pic of George Rogers . Don't know if it's been mentioned in this thread or not , but former Heisman trophy winner Rogers has a statue in front of the South Carolina football stadium . I believe Aja's statue will be at the basketball arena , probably near Dawn Staley Way .